Hello Rod, welcome back to TC! How do we find you today? Thanks Jon, all good. Great to be back to follow up on our last interview in 2007. A lot has certainly happened in that time! Talk us through a usual day-in-the-life of Rod Hunt at the moment? I’m usually in the studio by 10am, then it’s catching up with over night emails. If I don’t have to get straight on a job for a deadline, I’ll probably be doing a bit of promo – maybe updating the blog, website, flickr or an online portfolio. After that it’s heads down on the current job until 1pm, when I’ll stop for lunch. Maybe I’ll get out of the studio and go sit on the Thames river wall to get a break from the studio for a few minutes. Possibly I’ll do some reading back in the studio and catch up with design news. It’s important to be very aware of what’s going on in the wider design world beyond what you’re doing – you never know when that info might be useful! Then it’s back to work at 2pm, before a tea break around 4pm where I might meet up with some of the other illustrators on site at Second Floor Studios & Arts. Then a final stint until I leave for home, hopefully before 7.30pm. Of course, things are likely to vary depending on my workload & current deadlines. 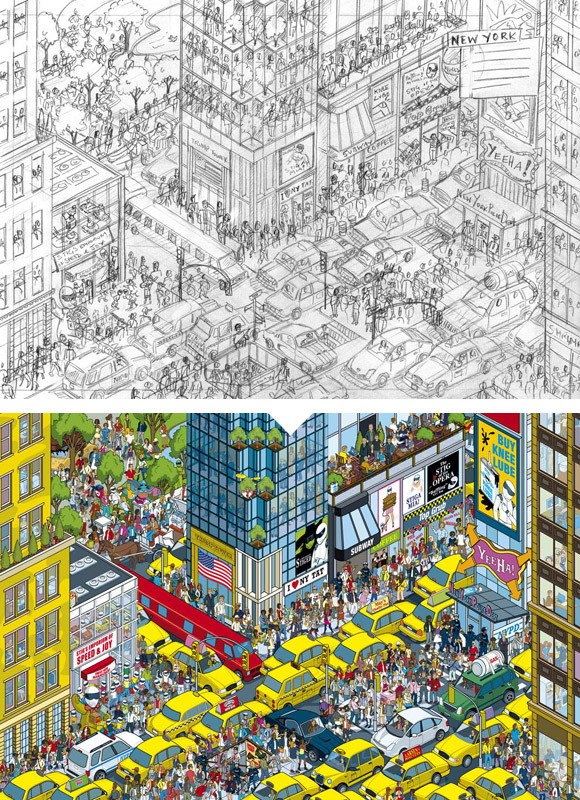 One of the most notable projects you’ve had in the last few years is Where’s Stig? – which you did for Top Gear. It seems to have exploded into a massive project, with multiple books, apps and event maps. How did the project come about? I’ve had an on going relationship with Top Gear that started with work for Top Gear Magazine in the early 2000’s. In 2008 they asked me to illustrate an “unrealistic car-toon simulation” of the Top Gear studio for the Big Book of Top Gear 2009. They were really pleased with the results and it got them thinking. We had a few conversations about expanding the style into a whole book, the logistics of it and the amount of work it would take to create. 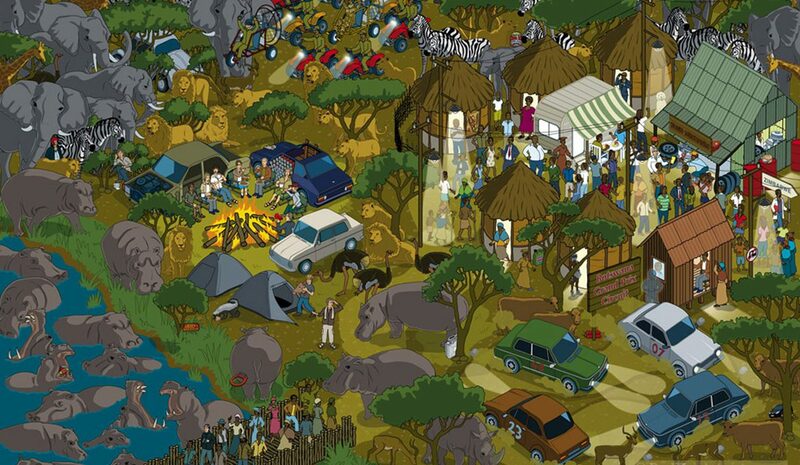 From this the idea of Where’s Stig? was born. The project was a huge commitment, taking a solid 7 months to complete. The first book was a massive hit, becoming Number 1 Sunday Times Bestseller, reaching number 6 in the UK Christmas book chart & has sold over 350,000 copies to date. The sequel Where’s Stig? The World Tour was released last September. 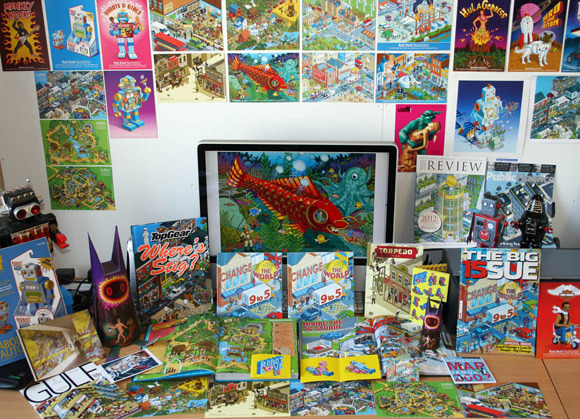 The first book was released as an iPhone & iPad app this year & has also been made into many products including jigsaw puzzles. There’s a mini “Glove Box” sized version of the book coming out this September too. Where’s Stig? is an unusual job and one I have a surprising amount of freedom on. Top Gear and my work are a good fit together with my sense of humor and attention to detail. The book is just me, cover to cover, so it’s a great platform to showcase my talents. It’s also a lot of fun working on a crazy project closely with one of the BBC’s most successful and popular programs. 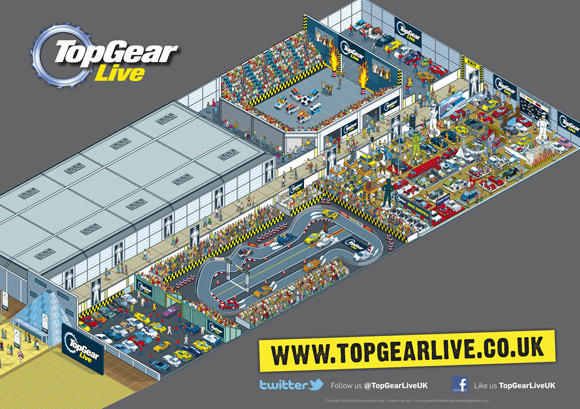 I’ve also recently finished creating the event map to promote Top Gear Live, the stage show and performance car show, at London Excel & Birmingham NEC this November, all in the crazily detailed Where’s Stig? style. 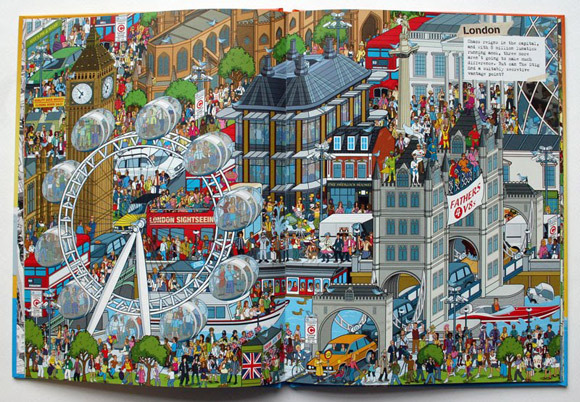 It must be a daunting task starting a new Where’s Stig? scene, as they are so complex. What process do you go through when creating a new piece? There’s a lot of research that has to go in to each piece, as many scenes are directly based on episodes of the show (such as the Vietnam or Deep South specials) or stunts they’ve done. I’ll research any visual reference material I need, watching relevant episodes of Top Gear (I’ve watched a ridiculous amount of Top Gear repeats on Dave over the last few years) and gathering pictures of things I’ll need to draw like the multitude of cars. There’s such a wealth of visual material from the show. It’s fun getting in all the geeky things and stunts they’ve undertaken, giving the show’s fans all the in-jokes. So there’s so much to choose from. The show can be a bit risqué, and the publisher and Top Gear are very supportive in not wanting to tone down certain un-PC elements. Everything starts in an A5 sketchbook with very rough and throwaway compositions to work out the overall page layout and where text will be placed. At this stage I purposely draw with a biro so that I can’t erase anything, keeping away from detail to keep the ideas flowing. Compositionally it’s important to have flow through the piece, leading the eye on a journey. The piece has to work as a whole and not look like the sum of it’s parts or be dis-jointed. I work out the total composition and design before even thinking about populating the world. It’s important not to be seduced into the detail too soon and lose sight of the the overall goal. After I’m happy with the very rough spread compositions, I moved onto creating a detailed fully finished A3 sized pencil rough drawing with a 2B pencil on heavyweight cartridge paper. It’s at this point I work out the amount of detail in the piece. The old adage “less is more” might not initially seem to apply to my work, but it’s far from chucking loads of stuff in and hoping it holds together. If I keep adding more stuff, it doesn’t automatically make it a better piece. In lots of ways it’s like having 20 illustrations in one, each small part telling a story in itself, which then forms a larger story. The roughs are then used as a guide in a background layer in Adobe Illustrator to produce the final artwork. 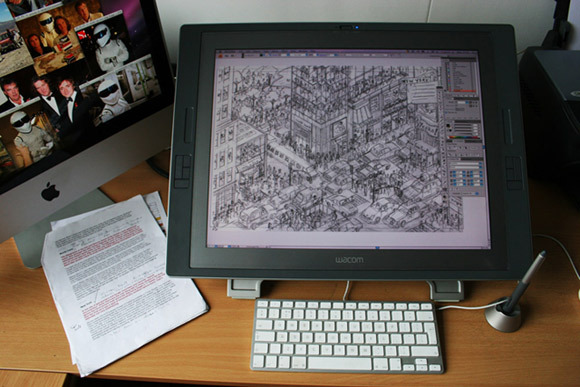 I decided to invest in a Wacom Cintiq for the 2nd book, to help with the work flow and speed things up. It was a pretty wise investment, as drawing directly onto the screen made things much more natural and intuitive. Everything is broken down into many layers so I can keep track of all the detail and make things easily editable for myself. 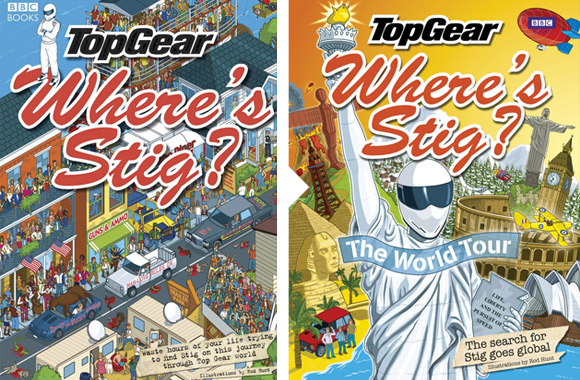 What’s your favourite Where’s Stig? scene? 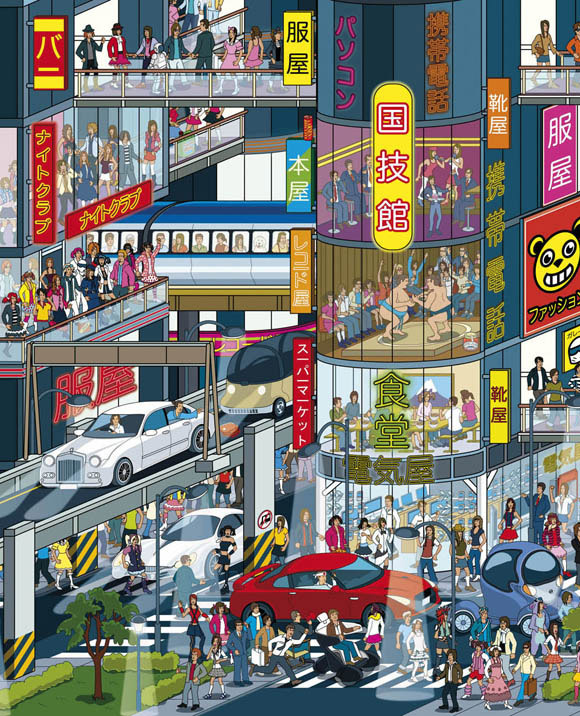 The Tokyo spread from the 1st book is a particular favorite, picking up on the Japanese style and culture, as is the Monaco Grand Prix from Where’s Stig? The World Tour as I’m a huge Formula 1 fan. A lot of your recent projects are very in-depth isometric worlds, ranging from theme park maps to faux-theme-park maps for sexual education campaigns. Was this an intentional move by yourself, or is it just what happened to come through? I never set out to work in this way, but it’s something that has evolved organically over time. I started creating isometric work at art college, where I painted with fat hogs hair brushes and acrylic paint on paper. After I gradated in 1994, some of this work was part of my portfolio. My second ever commission, which was for New Statesman magazine in 1995, was isometric. The next big leap forward was when I reinvented my work in 2001 by going completely digital, changing over to working in Adobe Illustrator. Lads mag Maxim asked me to create an isometric lingerie shop which helped me to develop my new digital isometric language. This then led to more commissions and refining of my style. 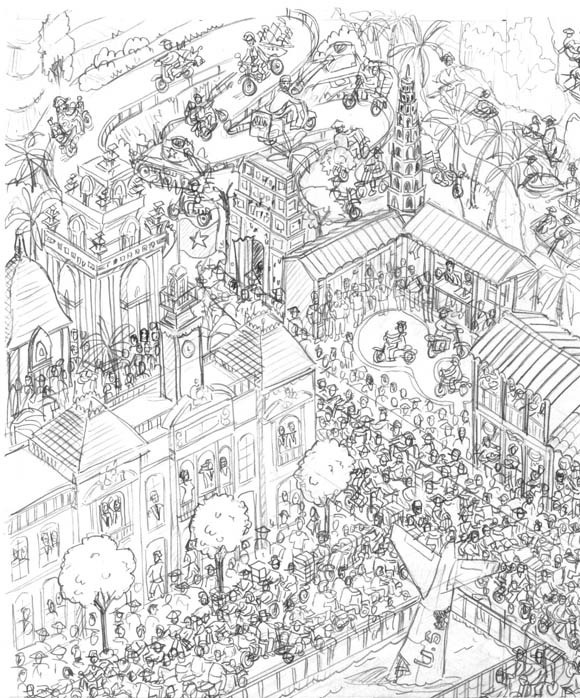 The book cover for Change the World 9 to 5 in 2006 then started me on the path of much more complicated scenes and cityscapes, the culmination of which has been Where’s Stig? which took the detail and sophistication to a whole new level. All along I’ve followed where I saw an opportunity. Your work is primarily digital. Do you still make much use of the sketchbook or other traditional mediums? Everything still starts in a sketch book, doodling very rough throwaway compositions with a biro. This then leads to a fully detailed rough pencil drawing which I use as a guide in Illustrator. I wouldn’t feel comfortable working completely digitally from the very start of a piece. I do buy a fraction of the materials I used to when I worked in traditional mediums, the reverse side of that is that obviously every few years I’ll have to spend a lot of money upgrading my technology. 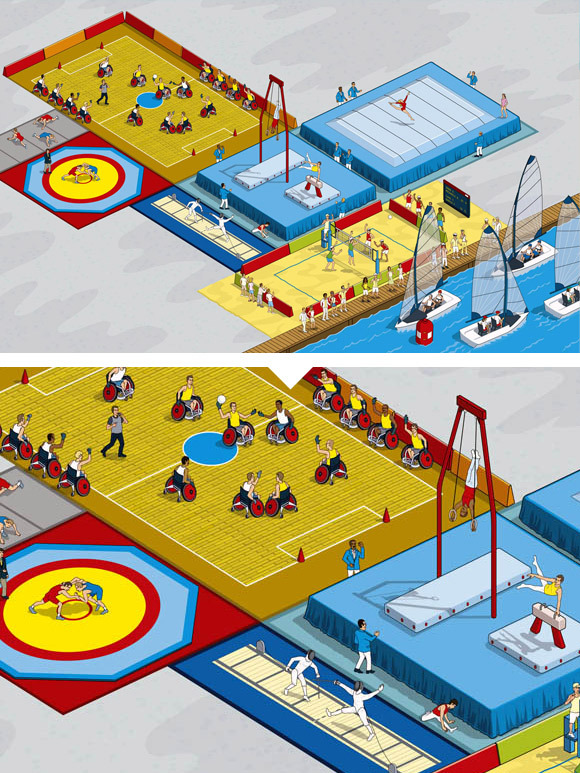 Another recent project of yours is stamp presentation kits for London 2012 for Royal Mail. 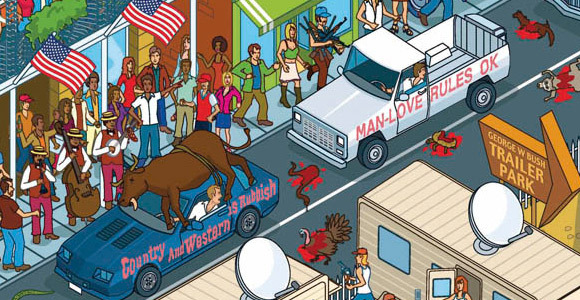 What was the most challenging sport to illustrate? The London 2012 Olympic and Paralympic Games stamp presentation pack for Royal Mail was a great commission to be involved with. The final set of 10 stamps were created by 10 different illustrators and were launched to coincide with the one-year-to-go celebrations. My presentation pack was challenging as there was a lot of research to ensure I depicted the details of each sport correctly, and the layout involved a lot of text giving expert commentary on the featured sports. You also did a campaign for Southern Railway. Can you tell us a bit about that? 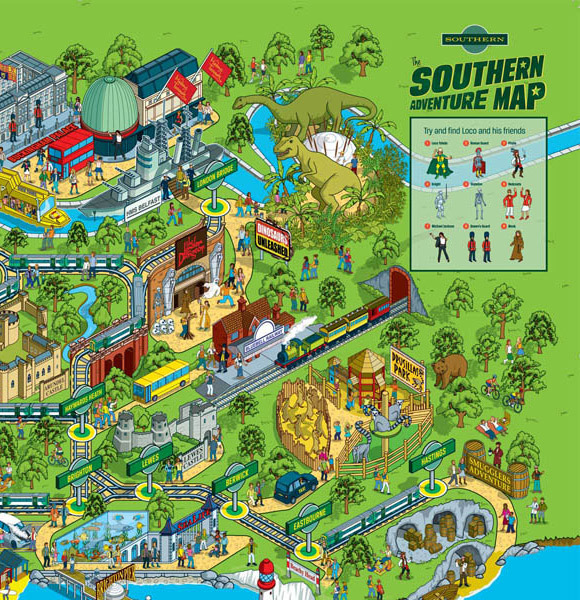 The advertising agency VCCP came to me with the idea of envisaging the Southern Rail network as a theme park promoting to families the many great tourist destinations that can be visited by rail over the summer months. The deadline was very tight with the amount of detail involved, as the campaigns launch was to coincide with the start of the school holidays. This is the kind of job I enjoy as it involves problem solving & design, making disparate elements work together to get across information in an entertaining and engaging way. We’re starting to feature more books on TC nowadays, so what would be on your must-read list for anyone in the illustration industry? If there was one book I’d say that every illustrator should own, it’s The Illustrators Guide to Law & Business Practice. It’s a comprehensive manual that covers all aspects of the law likely to affect illustrators. It contains recommended terms and conditions, advice on calculating fees, negotiating, copyright information, how to write a licence agreement and be protected against exploitative practices. It’s knowledge has helped me immeasurably over the years. We’re also fascinated by the spaces where artists create their work. Can you tell us a bit about your workspace and some of the things you couldn’t do your job without? My studio is right by the Thames Barrier in South East London at Second Floor Studios & Arts. I have a 200sqft studio room to myself amongst nearly 200 other artists studios. My studio also has a great view of the Thames itself and all the river traffic – see my flickr feed “Things that sail past my studio window”. Rod’s studio, full of his stuff! These days I couldn’t do without my iMac and my Wacom Cintiq screen tablet. My Cintiq was probably my biggest indulgence of the last few years, but has been a wise investment, making the whole process of using a tablet completely intuitive and more natural. Looking back (in honour of our previous interview! ), what’s the piece of work from your early days in the industry that you’re still most fond of? Change the World 9 to 5 has a special place in my heart as it opened lots of doors for me and really helped define my way of working & the path I’m now on. And as if your illustration work wasn’t enough… congratulations on becoming Chairman of the AOI! What does the job involve? Thanks. I’m just coming up to my second anniversary as AOI Chairman. I Chair the AOI’s Board of Directors, who are responsible for ensuring good governance and the strategic development of the company. It’s an unpaid voluntary role and can sometimes take up a considerable amount of my time. But I’m a passionate believer that we are stronger working together to protect & develop our industry through the AOI than working as individuals. The AOI has helped me develop my career, so I also feel that it’s important to give something back to help develop the organization for the future, support other illustrators and ensure the sustainability of our industry. At the AOI you must deal with a huge amount of illustrators. Who are some illustrators coming through that you think we should all look out for? AOI member Daniel Mackie, has been around for a while, but he’s recently completely reinvented his work by abandoning Photoshop for watercolors. 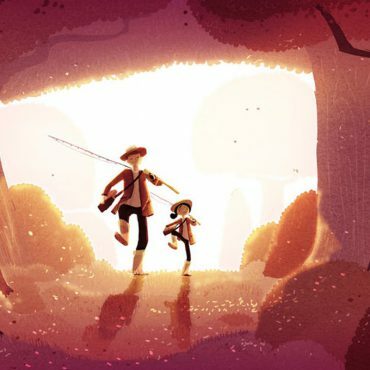 I thinks he’s creating some pretty exciting new work, and so do Creative Review, who awarded him Best in Book in their recent Illustration Annual. 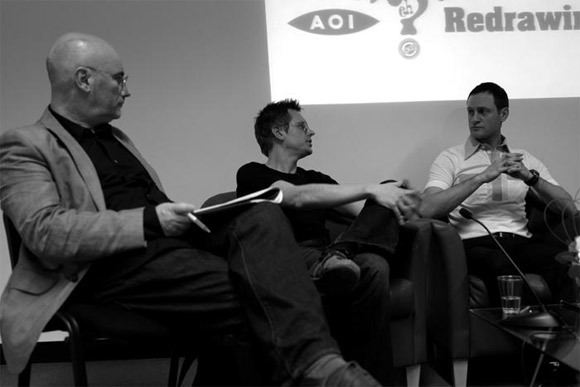 What benefits does the AOI bring to it’s members? I feel being a member of the AOI is a vital part of a professional illustration career. Being freelance can be a bit isolating and being part of the AOI can give you a sense that you’re not alone in this, you’re part of a community and you know where to get professional advice. It’s important to educate yourself about the business side of things as it’s just as important as the drawing if you want to be successful and sustain your career for the long term. With pricing, contracts, copyright & business development it pays to get advice from the professionals, and that’s just one phone call or email away by being part of the AOI. 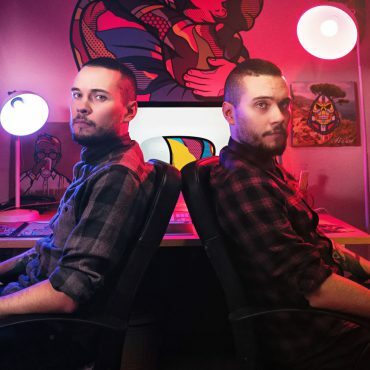 They’re there to help with all aspects of advice and developing your creative career. On a different note… what’s the most interesting thing you’ve bought re-cently? I did break down & buy the beautifully produced retrospective book called Charley Harper – an illustrated life. Check out the all new Thundrchunky of course! You can check out more of Rod’s work over at his portfolio, or follow his updates on his blog. And if that’s not enough then you can find him on Twitter too (@rodhuntdraws). 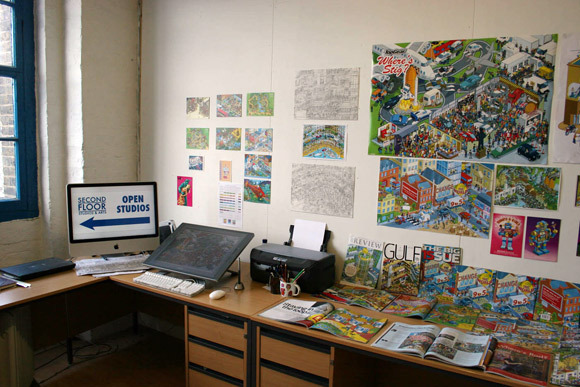 And if you’re an illustrator then definitely go and have a lot at the AOI site! Rod's studio, full of his stuff! 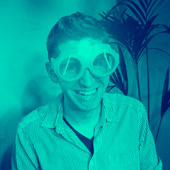 By the power of VAN ORTON… we have the colour!